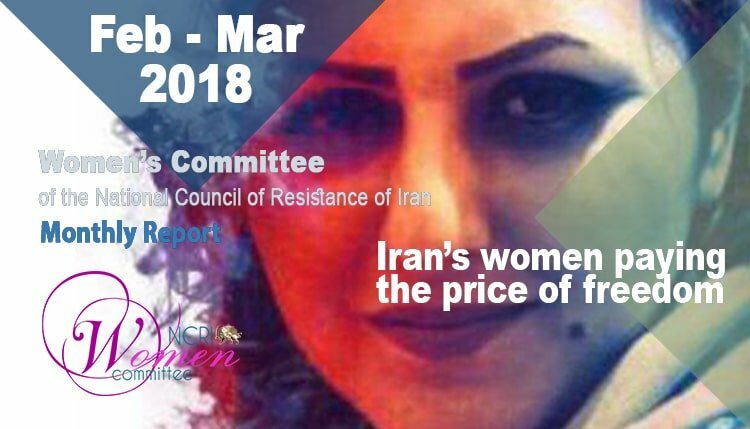 Iranian women’s resistance in prisons overshadowed the news of February and March. Topping them all was the continuing hunger strike of political prisoner Golrokh Ebrahimi Iraee and her staunch resistance along with her fellow inmate Atena Daemi. Ms. Iraee is in coma after 62 days of hunger strike in protest to her unlawful exile to the notorious Qarchak Prison in breach of the principle of separation of prisoners’ categories, demanding to be returned to the Women’s Ward in Evin Prison. The NCRI Women’s Committee issued a call, urging human rights and women’s rights organizations to immediately take effective measures to save Golrokh Iraee and obtain her unconditional release. A writer and a human rights activist, Ms. Iraee has been sentenced to six years in jail for writing an unpublished book on the cruel punishment of stoning. Her husband Arash Sadeghi, also a human rights advocate serving a 19-year prison term, put his life on the line by staging a 72-day hunger strike protesting the illegal arrest and detention of his wife, and demanding her release. The imprisoned couple attracted nationwide and global support, forcing the regime to release Ms. Iraee. Nevertheless, security forces re-arrested her in January 2017 reneging on the promise made by the Prosecutor. Throughout her imprisonment, Ms. Iraee has been speaking out against the regime’s injustices, her latest being an open letter on January 9 amidst the nationwide uprising demanding regime change. It was in reaction to this call, that the regime took reprisal on her and her fellow inmate Atena Daemi who had sent out a similar open letter a few days earlier. Evin’s Prosecutor fabricated a new case against the two political prisoners and summoned them five times for interrogation. Finally, on January 24, 2018, the resistant prisoners were taken by force for interrogation to the IRGC Ward 2A in Evin and in reaction to their strong resistance, they were brutalized and transferred unlawfully to the notorious Qarchak Prison in Varamin. Golrokh Iraee and Atena Daemi demanded to be returned to Evin, setting a deadline of 10 days before going on hunger strike to protest the regime’s breach of the principle of classification and separation of prisoners and their illegal exile to Qarchak. On February 3, they started their hunger strike and switched to dry hunger strike on February 10. The two prisoners’ conditions rapidly deteriorated in light of the deplorable prison conditions. Ms. Iraee’s conditions in Qarchak Prison has been excruciating. Qarchak Prison is a disused chicken farm that holds hundreds of women convicted of violent offences in conditions falling far below the UN Standard Minimum Rules for the Treatment of Prisoners (the Nelson Mandela Rules). Common complaints include urine-stained floors, lack of ventilation, insufficient and filthy bathroom facilities, prevalence of contagious diseases, poor quality food containing small pieces of stone, and salty water. On February 20, Ms. Iraee and Ms. Daemi were deprived of contacting their families and can call them only once a week in the presence of prison agents. They were held in conditions similar to solitary confinement. They were not allowed to leave the ward and no one had permission to visit them. The National Council of Resistance of Iran (NCRI) issued a call on February 21, 2018, urging international human rights and women’s rights organizations to take immediate and effective measures to save the lives of two jailed hunger striking prisoners, Mrs. Golrokh Iraee and Mr. Sohail Arabi, who are at risk. Amnesty International issued a statement on March 9, 2018, expressing alarm at the condition of Golrokh Iraee and demanding her and Atena Daemi’s immediate release. Ms. Iraee and Ms. Daemi originally detained in the Quarantine Ward, were again brutalized on Monday, March 12, 2018, and dragged to the ward of mothers where pregnant women and some 20 children are detained with their mothers. Considering the state of health of hunger striking Golrokh Iraee, the mothers’ ward is an additional pressure on her. Haj Moradi, deputy Prosecutor of Evin overseeing political prisoners, has told the prisoners’ families that Golrokh will not be returned to Evin even if she dies. Other reports indicate that the order for transfer must be issued by Tehran’s Prosecutor, Jaafari Dowlatabadi. On March 15, Chair of the Human Rights Subcommittee (DROI) of the European Parliament, Mr. Pier Antonio Panzeri (S&D, IT), expressed grave concern over the detention of two women human rights defenders in Iran and called for their immediate release. He said they are serving lengthy and unjust prison sentences that were handed down solely for their peaceful human rights work. The experts called on the authorities to carry out a prompt and impartial investigation into the allegations of beatings, and to ensure accountability for such actions. At the time of writing, Golrokh Iraee has gone into coma and reportedly transferred to a hospital near Shahr-e Ray (Qarchak) Prison for her constant feeling of nausea and vomiting bile due to damaged gall bladder. The hospital’s name has not been announced. There has been no news of Ms. Iraee after her hospitalization and her family’s inquiries have not been responded to. Another newsmaker was Maryam Akbari Monfared who spoke out from behind bars, rebuking Salavati, one of the clerical regime’s notorious judges, who sentenced Ms. Akbari to 15 years’ imprisonment. “Amidst so much misery and misfortune, the mullahs have sensed that their end is imminent. They seek to cover up so many years of oppression and what they have done to the people of Iran with the deceit of amnesty. “After nine years of imprisonment, I am proud and steadfast and my heart is filled with joy for all of its moments. Not only I demand justice for my sister and brothers, but also for myself for the life you stole from me, the childhood you stole from my children and deprived them of living for nine years. So, my enchained compatriots and I are the ones who must grant you amnesty. Mothers of political prisoners also stood for their children. Mrs. Dayeh Sahrifeh was summoned on February 2, 2018, by the Department of Intelligence of Sanandaj and pressured to cooperate in breaking the hunger strike of her sons in prison. Mrs. Sharifeh’s sons, Ramin and Afshin Hossein Panahi, are political prisoners condemned to death and 8 years in prison, respectively. Mrs. Farangis Mazloum has also staged a campaign to save the life of her son. She has been calling for demonstrations and protests in front of prisons, the parliament and other places to pressure the officials to release her son, Soheil Arabi, a web blogger who has been imprisoned for writing against the regime’s unjust practices. Another manifestation of Iranian women’s resistance was in their participation in anti-government protests. Altogether, they participated in at least 55 protests and demonstrations in February and March. On the International Women’s Day on March 8, Iranian women took to the streets of Tehran after 39 years and staged a protest outside the Labor Ministry. Security forces, plainclothes agents and female troops stationed in the area, attacked the participants and brutalized them with batons and shockers. Security forces did not allow anyone to take pictures or shoot films of this gathering. At least 14 of the arrested women were transferred to Qarchak Prison in Varamin where they were deprived of access to water and hygienic material. Mahshid Pour Assadi, graduate of philosophy from Tehran’s Allameh University; Marzieh Amiri, student of Social Sciences at Tehran University; and Atefeh Khosravi, a medic; were detained in the general ward of Qarchak Prison. The secretariat of the National Council of Resistance of Iran issued a statement, calling on international organizations to condemn the raid on women and take urgent action to free those arrested. Thousands of women also actively participated in the late March protests in Ahwaz, capital of Khuzistan Province in southwestern Iran. The protests starting on March 28 and continuing into April were against racist approach of the state television against Iranian Arabs. Protesters put on Arabic garbs and chanted slogans in Arabic and Farsi, demanding resignation of the head of the state Radio and Television Station in Khuzistan, official apology to the Arab ethnic group from managers of the state Television Network 2, and reprimanding of those in charge of the racist program. At least two women, Ayesheh and Khadijeh Neassi were identified among hundreds arrested in these protests in cities and villages across the province. At least 70 women dervishes were taken to Qarchak Prison. They were among those arrested during the crackdown on the dervishes’ gathering in in Tehran on Monday night, February 19 which carried through until Tuesday morning, February 20, 2018. They were brutalized and taken to the Quarantine Ward 3. A pregnant woman, Leili Nayeb Zadeh, was among those arrested. The NCRI Women’s Committee issued an urgent call on February 20, urging international human rights organizations to undertake immediate measures to have the arrested women released. Amnesty International issued an Urgent Action on March 29, 2018, condemning the arbitrary arrest and ill-treatment of 11 women from Gonabadi Dervish religious minority. AI statement said security forces resorted to beatings, firearm use, water cannons and tear gas to disperse the crowd. The women were taken to Vozara detention centre where they said they were subjected to intrusive body searches by female officers, intimidating interrogations, insults and yelling. In the following 24 hours, the authorities transferred 10 of the women to the quarantine section of Shahr-e Rey prison near Tehran and released the rest. Those transferred are Shokoufeh Yadollahi, Sepideh Moradi, Maryam Farisani, Nazila Nouri, Sima Entesari, Shima Entesari, Shahnaz Kiani, Maryam Barakouhi, Elham Ahmadi, and Avisha Jalaledin. After several days, an 11th woman, Sedigheh Safabakht, who was apparently held in Evin prison before, was also transferred to Shahr-e Rey prison. There are reports that some women are undergoing late-night interrogations involving verbal abuse and threats. In recent days, women prisoners have complained that fumes have escaped from the drainage system, filling their rooms with foul odours. As a result, Shima Entesari, who suffers from asthma, has experienced severe breathing difficulties requiring supplemental oxygen. Additionally, eyewitnesses have said that security forces severely beat Shokoufeh Yadollahi at the time of her arrest, resulting in head injuries. The authorities have denied her access to medical care apparently after she refused to be transferred to hospital in handcuffs and leg cuffs. In continued crackdown on participants in the nationwide uprising in December and January, the regime arrested more women, university students, or handed out heavy sentences for them. Leila Hosseinzadeh, a student of anthropology at Tehran University, was sentenced to six years in jail – five years for assembly and collusion and one year for propaganda against the state. She was also banned from leaving the country for two years. Banafsheh Cheraghi, a sciences student at Tehran University, was arrested at home on Tuesday, March 6, 2018, by security forces. Parisa Rafii, 21, a student of photography at Tehran University’s School of Fine Arts, was abducted by plainclothes agents as she was leaving the school on February 25, 2018. Ms. Saghiri was arrested at Sa’at Square of Tabriz on December 31, 2017, and has been detained since in the Women’s Ward of the Central Prison of Tabriz, capital of the northwestern Iranian Province of East Azerbaijan. The regime also took hostage the wife of a Kurdish activist. The wife and two children of a Kurdish activist were arrested by agents of the Intelligence Department on Saturday, March 3, 2018, when they arrived at the Airport of Tabriz from Istanbul, Turkey, where they had visited their husband and father, Barzan Faroughi. The children, 12 and 5, were released after three days, but Mrs. Shetaw Faroughi remains in detention. She was transferred to the Central Prison of Sanandaj, capital of the Iranian Kurdistan Province, on Saturday, March 24, 2018. Mrs. Faroughi has to provide a bail bond of 200 million toumans to be temporarily released. Accordingly, Maryam Shariatmadari was sentenced to one year in jail on the charge of “encouraging corruption through removing her veil.” The decree was issued on March 25, 2018, by the 2nd Criminal Court of Tehran Province. Maryam Shariatmadari, 32, is a student of Computer Sciences at Tehran’s Amir Kabir University. She was pushed off a telecoms box by a State Security Force officer and hurt in the knee on February 23, 2018, when she was protesting the compulsory veiling by removing her shawl. The Women’s Committee of the National Council of Resistance of Iran condemns any form of attack, brutalizing or hurting the women who oppose the compulsory veil. The Women’s Committee has also called for the immediate release of all women who have been arrested and imprisoned for improper veiling or removing their veil, and for protesting and opposing the compulsory veil and considers imprisonment verdicts for protesters against the compulsory veil as unjust. Political prisoner Sohail Arabi was banished to the Greater Tehran’s Prison, aka Fashafouyeh, for going on hunger strike and protesting the unlawful transfer of Atena Daemi and Golrokh Iraee to Qarchak Prison. He ended his hunger strike on the eve of the Persian New Year after 55 days. He was brutalized in prison while on hunger strike and was suspected of suffering brain damage due to harsh beatings on his head. Mr. Arabi’s mother, Farangis Mazloum, has staged a campaign to save the life of her son but has not been able to secure his release or even visit him.